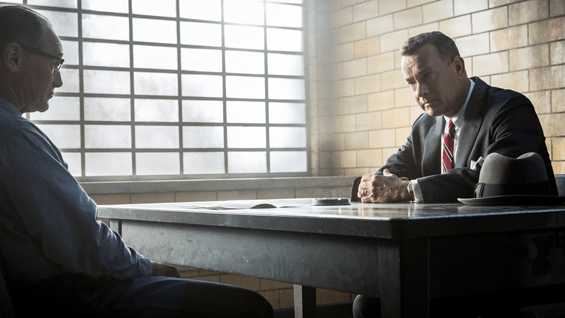 No smooth spy heroics, action chases or Bond fantasy-espionage here – Bridge of Spies deals with the confusing, convoluted, sordid and often thankless business of spying. A dangerous game played by petulant children who manipulate each other in an attempt to come out on top. If we are lucky, a grown-up may stumble unwittingly into the fray, and through guileless clear-sightedness and dogged adherence to principle, might actually get something done. The tense negotiations regarding the recovery of U2 pilot Gary Powers in Berlin in 1962 are the real-life inspiration for this screenplay by up-and-coming British dramatist Matt Charman, aided in parts by the recognisable magic of Joel and Ethan Coen. The Americans hope to hand over the Russian spy Rudolf Abel, in a cold war prisoner-exchange-at-dawn on the Glienecke bridge spanning East and West Berlin – with snipers waiting on both sides in case of a last-minute betrayal. Tom Hanks plays James Donovan, a shrewd but honourable insurance lawyer assigned to defend the accused Soviet spy, Rudolf Abel (Mark Rylance) by his boss (Alan Alda) who, like his government, expects Donovan to merely pay lip-service to the job so that the American judicial process can maintain the appearance of fairness, even in the case of an ‘enemy’. “Everyone will hate me, but at least I’ll lose,” Donovan jokes, contemplating his brief. However, amiable as he is, Donovan is not as pliant as the powers that be would like to believe, so he mounts a proper defence for Abel, arguing that the seizure of evidence was unconstitutional and that his client should be treated as humanely as they would wish any American POW to be treated by the enemy. His attempts are greeted with open hostility as the public clearly just want to see Abel hanged. Considering how much of an optimist Spielberg usually is regarding the American way, it is intriguing how negatively the movie portrays the American public – everyone here, from citizens, to cops to senior judges, have a mulish, lynch-mob mentality. Donovan also goes so far as to make an unpopular but convincing case to have Abel imprisoned rather than executed, in case he’s ever needed as a bargaining chip. Donovan’s efforts are vindicated when Francis Gary Powers (Austin Stowell), the young pilot of a top-secret U-2 spy plane, is shot down over Soviet Russia and imprisoned. Simultaneously, Frederic Pryor (Will Rogers), an innocent American economics student studying in Berlin, has been captured by the paranoid East German police and accused of spying. As Abel’s state-appointed representative, Donovan is sent to Berlin to negotiate a trade – and again, flying in the face of the wishes of the CIA, he decides to pursue a two-for-one exchange. This is politically awkward, as the East Germans wish to assert themselves as independent of Soviet influence. After the prosperity of sixties America, the scenes in a wintry Berlin have an unsettling, Kafka-esque ambiance, as Donovan ventures past checkpoints and through a maze of sinister, grey streets in search of his contact – an elusive lawyer called Mr Vogel. We are in an unfamiliar world of subterfuge, duplicity and deception, embroiled in a war that does not involve hand to hand combat, but the spinning of misinformation. Even as he explores the worst in human nature, Spielberg has the gift of discovering decency and moral courage amidst the shenanigans of Realpolitik. He could have easily have opted for a simplistic portrayal of the Russians and Germans as cartoonish enemies with an all-American protagonist saving the day. Instead he chooses to draw parallels on each side, offering the more realistic idea that each spy was simply doing their duty in loyalty to their own country (although he can’t quite resist giving the Americans the moral high-ground in the civility with which they interrogate a spy). Like most Spielberg movies we are invited to engage with rounded and sympathetic characters .This has always been Spielberg’s strength and other directors would be wise to learn a little of this technique, as so many characters in mainstream movies are underwritten at the expense of overblown visual extravaganzas (yes, I’m looking at you Ridley, but you’re not the only one). 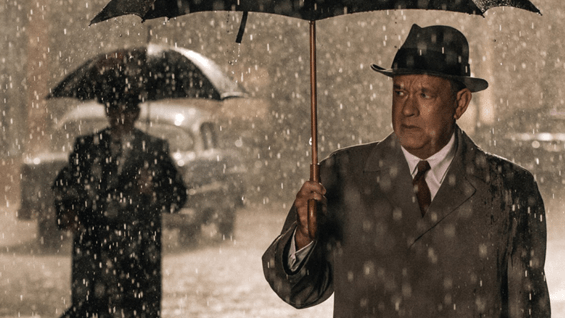 He has chosen two excellent leading actors – Tom Hanks is this generation’s James Stewart, and this movie is almost like the great James Stewart Cold War movie that never was. Where Hanks’s Donovan is astute, ingenuous and straightforward, Mark Rylance, the much celebrated British stage actor, turns Abel into a soft-voiced enigma. Rylance’s spy is a sensitive artist surprised by the arresting officers in his Brooklyn apartment while dressed in his underwear, and who meekly asks if he has time to put in his false teeth. His calm demeanour never comes across as arrogant, which it could have done every time Donovan asks him “Aren’t you worried?” and Abel deadpans: “Why? Would it help?” Rylance’s gentle, musical voice makes this repeated, wry gag work beautifully. Spielberg understands what Abel and Donovan respect in each other— they are both men who refuse to take the easy way out, they can both see the bigger picture and they are, at core, loyal to their task and honest about who they are. 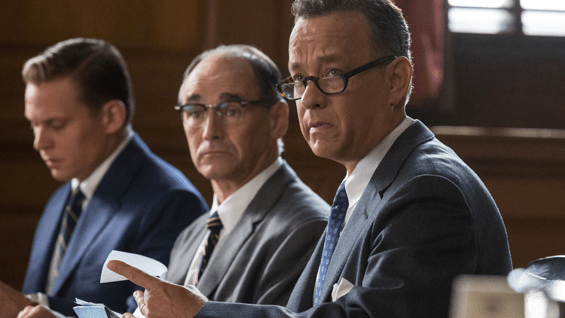 If the trailers make Bridge of Spies look like an action film, don’t be misled. This is a movie driven by character, dialogue and design. It’s a film that builds tension through conversation – as Donovan discovers, the world of espionage is all about talking – it is about gauging who you’re dealing with and seeing past the subterfuge. To that end Matt Charman and the Coen brothers have come up with a striking script and the movie can boast an unusual attention to detail. The costumes and sets are all seem realistically ‘lived-in’. I was also struck by Janusz Kaminski’s colour palette, distinguishing the comfortable warmth of the United States to Berlin where everything is washed in severe blues and greys. Last year, Steven Spielberg was listed by Forbes as one of the most influential celebrities in America; this year, he is being given the Presidential Medal of Freedom by Barack Obama. He remains the highest-grossing director ever. Spielberg is often seen as a director of adventure and fantasy, but it is his ability to distil historical events into relatable, human stories in films like Schindler’s List, Munich, Saving Private Ryan, Lincoln and others that also make him an ‘important’ practitioner of his craft, an aspect that has arguably been underrated throughout his varied career. 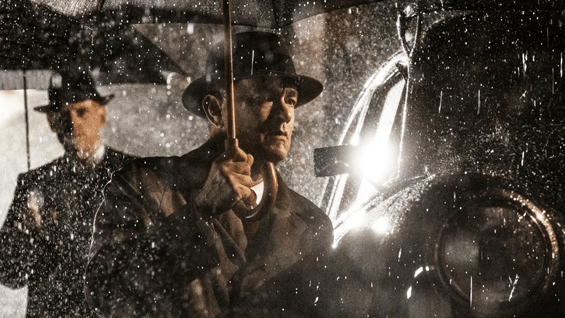 In Bridge of Spies he continues that valuable service. Bridge of Spies (2015), directed by Steven Spielberg. Written by Matt Charman, Ethan Coen and Joel Coen. Starring Tom Hanks, Mark Rylance and Alan Alda. 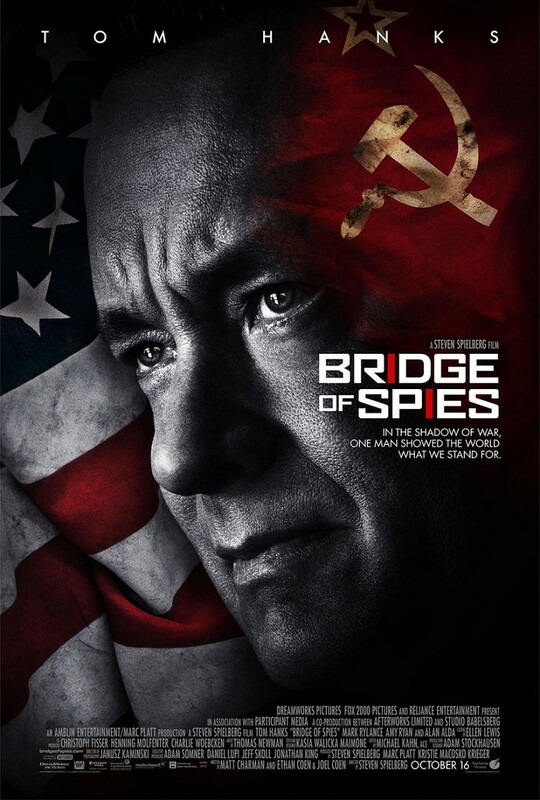 Bridge of Spies is available to buy from Amazon.co.uk ; plus if you decide to make a purchase after following the link provided you will have supported Attack From Planet B, so thank you.